Access your Google Drive from Zenkit directly so you can quickly attach files to items. Google Drive is a collaborative cloud-based file sharing system. Sign up for a Google account to get access to Google Drive. 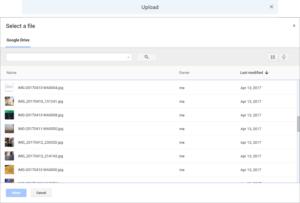 Choose Google Drive from the list of options in the upload popup. Choose a file from your Google Drive then click ‘Select’. Your Google Drive file will appear in the list of attached files on the item.